Students NOT in Good Standing – If you are astudent that is in good standing, please remember that you are not to have your phone with you at school. If you happen to have brought your phone to school on accident, please make sure you bring it to Shirley’s office until the end of the school day. It is your responsibility to bring your grade up and to get yourself back in good standing so you can enjoy the privildeges of attending after school activities such as wrestling meets, basketball games, or school dances. Dance Rules – Just a reminder about the expectations for students as they attend the dance Friday night. There are no outside drinks allowed in the dance; you will be able to purchae water and soda there. Be safe and respectful during the dance with no running or shoving. Please make sure you are dressed appropriately for the dance. And lastly, leave the decorations alone. Without question, noone should be touching or pulling down the decorations for the dance that students have worked so hard for weeks for this special occasion. If you are found in violation of these rules, you will be asked to leave the dance and have your grown-up pick you up as soon as possible. New Clubs – Coffenberry will be starting up some new afterschool clubs very soon! Marvel Club, LGBTQIA+ Community Club, and Anime Club will be starting soon. Information and permission slips will be available at the office very soon. If you are interested in starting a club, feel free to come by Mrs. Maloney’s office to find out how to get an afterschool club started. Honor Roll – Hey hey hey the Honor Roll is published! If you are on it you will receive a green permission slip during 7th period today for Diamond Lake. Make sure you get it signed and returned to Mrs. Lind or Peggy as soon as possible! Spirit and Pride – Do you need some Hornet swag? 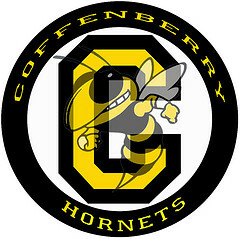 A Coffenberry t-shirt or sweatshirt to show your hornet pride and wear on Wednesdays? Well, good news…we are going to be ordering t-shirts once again from Spirit and Pride. There are different styles to choose from and ordering is easy! Order forms will be going out tomorrow during your 7th period classes. You have until next Friday, February 15th, to return your orders back into the office to Shirley. Let’s get these halls filled with Spirit and Pride! Lady Hornets – Our 7th and 8th grade girls basketball teams have their games in Sutherlin today. Ladies, your game bus will be leaving at 2:30 and the first game begins at 4:00pm. Good luck lady hornets and bring home the wins!